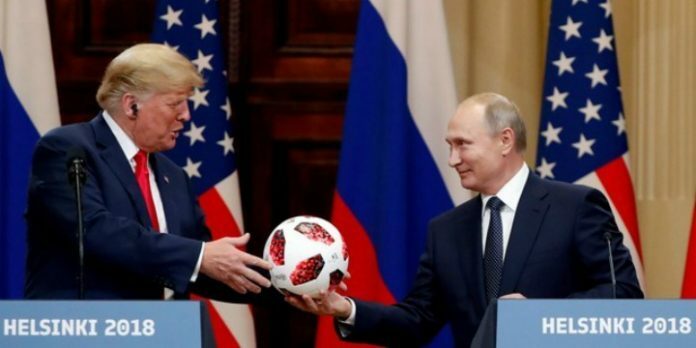 Depending on whom you ask, President Donald Trump’s post-Russia summit news conference Monday was something between a bad misstep to proof of outright treason. Mostly because of his refusal to publicly scold President Vladimir Putin over alleged meddling in the 2016 election, as if that was likely to happen right to Putin’s face and in front of the cameras. President Trump also took massive heat for again criticizing the controversial investigation into the 2016 election conducted by special counsel Robert Mueller. This was described by many as throwing the U.S. intelligence community under the bus in favor of Russia. Yes, this is just another excuse for Trump haters and usual suspect blowhards to rush around with their hair on fire. The topic changes almost daily. It was special because while this news conference induced a response from his opponents that was really nothing new, it actually provided the president with what very well could be his finest hour. Actually, this may be the most important statement any president has made in decades. The reason is because it’s so credible, considering the source. President Trump has spent years cultivating his brand as a leader who doesn’t really care what politicians and media critics say. We’ve heard countless elected officials and candidates claim this about themselves for years, but Mr. Trump keeps proving it every time he insists on saying and doing the things that will bring him the most criticism. The irony is that if you asked every American voter if he or she would prefer a candidate who does what he or she thinks is right above all, many would say they would. Well, now America has that person in the White House and about half of those same voters are upset about it. By contrast, the president’s establishment opponents doubled down Monday on something we’ve all known about them for years: they value words over actions every single time. It wasn’t until the final months of Obama’s presidency that he changed his tune about Russia. He did impose some sanctions, (that are still under effect under President Trump), and he started to talk tougher about Russia. This was all to the delight of the same people and so-called experts who laughed and poked fun of Romney in the wake of Obama’s line, even as they ganged up against Romney throughout the election. President Trump isn’t looking to score points with one-liners. He’s trying to affect better policy and get good results. Obama and everyone else can play to the laugh tracks. But let me explain why the news conference was such a victory for the president over and above the recharging of his valuable “political outsider” brand. A precious few political observers have long understood that the Democrats’ focus on the Russia probe is actually a plus for the Trump team. That’s because that Russia obsession is part and parcel of one of the most foolish things any political movement or party can do after an election: refuse to believe they lost. Every day Democrats pay more attention to an election now almost two full years in the past is a day they lose an opportunity to focus on preparing for the next presidential election. The fascination with the fantasy that Hillary Clinton may have somehow been cheated out of the White House keeps this toxic personality as the de facto leader or even frontrunner to lead the party’s ticket again in 2020. The Democrats really have no new leader, even in the face of a devastating election loss 20 months ago. Their only real issue is opposing Trump and stoking a nationwide sore loser campaign about 2016. You don’t need to be a political genius to know this is a recipe for disaster for them and recipe for another victory for Donald Trump. This isn’t just hampering the Democrats’ cause regarding the 2020 election, but it’s also throwing a wrench in what seems like a 24/7 “resist Trump” effort. While they repeated conspiracy theories about Russian collusion through 2017, they failed to stop the Trump tax cut bill and the confirmation of Justice Neil Gorsuch. Speaking of judges, the Trump administration confirmed more federal judges to lower courts than any administration in decades. Yes, the Trump team had the elimination of the Senate filibuster to thank for that. But it was also the result of the Democrats and their media allies failing to mobilize their potent smear machine that could have derailed a large number of those nominees had it had the proper focus and energy. There are many more examples of missed opportunities for the left because of this distraction and now it’s been recharged yet again. We still have no evidence that the Russians did anything more than try to meddle in our elections. I put the emphasis on try because there’s no proof that one vote result was changed or one voter’s mind was changed by that attempted meddling. For all we know, the United States did more illegal foreign election meddling when the Obama team worked to undermine Bibi Netanyahu’s election as Israel’s prime minister in 2009. None of this means Russia is a friend. But since when does saying Russia is an enemy over and over going to get us anywhere? The Democrats seemed to understand this when Obama was president, but all previous knowledge and experience seems to go by the wayside in this particular obsession. The anti-Trump forces will find something else to go crazy about tomorrow and next week. But there is no distraction they have crafted for themselves that hurts them more and pays more dividends for President Trump than the Russia narrative. The difference is that this time, it’s not just a distraction. This time, President Trump has used it to declare to everyone how unaffected he is by critics, and he will continue to do what he feels is right. This “I would rather take a political risk …” quote from President Trump today may be inscribed in giant letters above his presidential library one day. Saying things like that gets presidents all the time; it’s just that almost none of them have ever fulfilled that promise. So far, it looks like Donald Trump truly is. Jake Novak has been a TV news producer and editorial columnist for more than 25 years. He has produced shows at CNBC, CNN, FOX, and several local stations across the country. Novak is a graduate of the Yeshivah of Flatbush, has a bachelor’s degree in political science from Columbia University, and a master’s degree from Northwestern’s Medill School of Journalism. Follow him on Twitter @jakejakeny and watch out for future columns on 5TJT.com. Next articleStanding Up for the Elderly: Is it Sixty or Seventy? Every word Trump says, every action he takes, is fueled by one goal – to bolster his support. Not from the mainstream media or democratic politicians. From his political base. The people who believe his crowd was bigger than Obama’s. The people who don’t believe the Russians meddled in the election. Let’s be honest.